Small business owners like you have the ability to set up automatic email marketing that will go out like little salespeople over time and help you make more money. 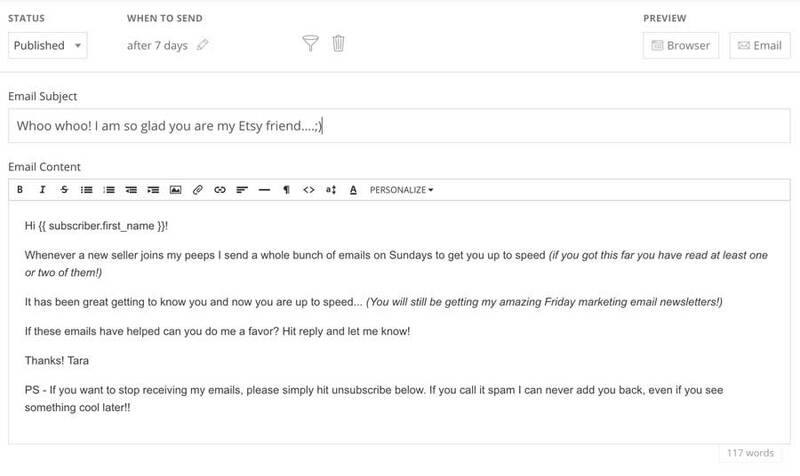 Here are my best tips and ideas to help you set up and run amazing email autoresponders! 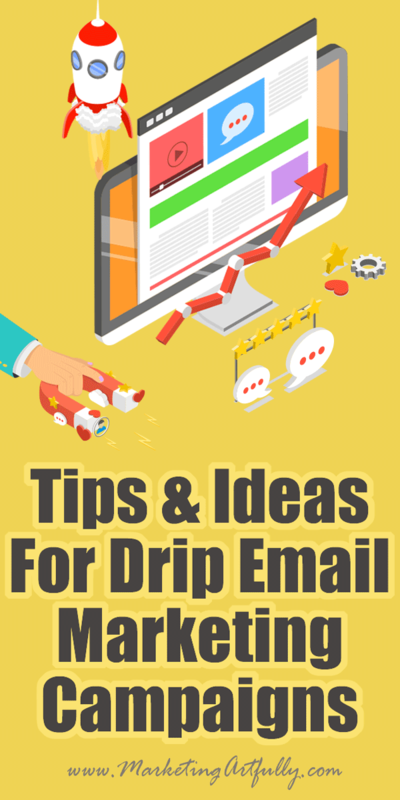 Email autoresponders are called a lot of things, drip campaigns, email sequences just to name two. If you are just getting started with email marketing, I recommend you start with this first… All My Best Tips and Ideas For Email Marketing! I asked my peeps to send me their questions about autoresponders and this is the one I got the most! Functionally how does it work? 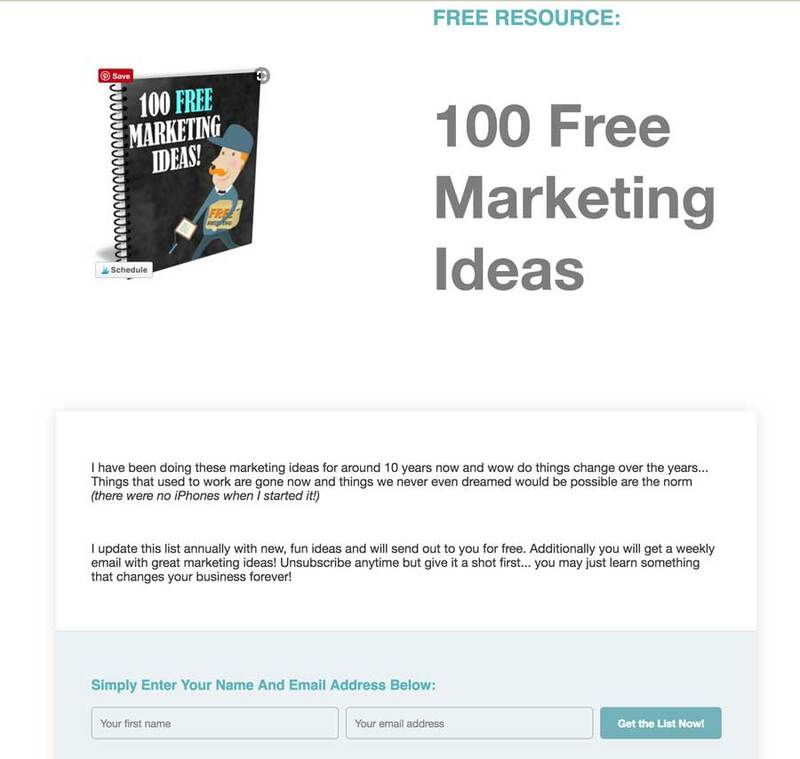 In this example, anyone can sign up for my 100 Free Marketing Ideas using this form. Do you need to offer something for free? Before we go any further, let’s talk about something pretty controversial. Common marketing wisdom says that you HAVE to offer something for free, but the majority of my email signups come from that button at the top of my pages which is just a newsletter signup button, NOT a free offer. 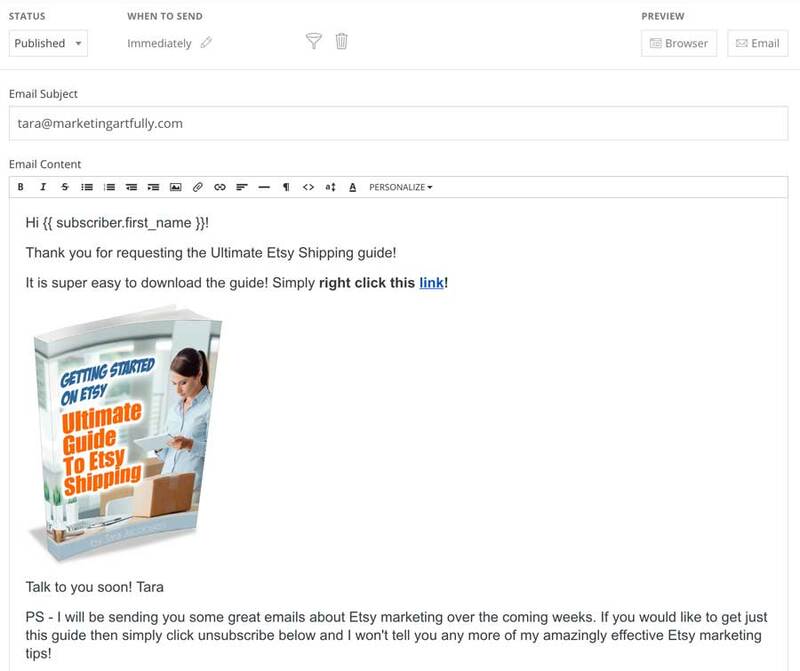 Offering something super specific for free is a great way to grow a targeted email list! The next thing you should do is send a “thank you for signing up” or “fulfillment” email. For example, I would send out the actual ebook that I promised in the Ultimate Shipping Guide signup form. This email is super important because it is oftentimes the first time someone has gotten an email from you and it will set the tone for whether you will impress them, or simply send this one out and then have an unsubscriber. You can do a bunch here, but first fulfill your promise by giving them whatever they signed up for! I then tell them that I will be sending more emails and suggesting that they can unsubscribe if they don’t want to get anything else… wait, what?!?! I suggest they unsubscribe? Yep, there are certain people who ONLY want my guide and don’t want to be on my regular mailings and that is okay! Not everyone will want to be a regular subscriber, and it is best to get them off my list now when they still like me, rather than waiting a week until they get another email and mark me as spam. And if this was a regular newsletter / broadcast email signup, this is where it would end, but NO! We are doing an autoresponder so this is when it starts to get good! Okay, now we are into the meat of the autoresponder… the followup emails! I call these my “Onboarding Emails” because I am getting my new subscriber up to speed on me and everything I can help them with! Do you know the secret of seasonal marketing yet? How to use “popularity” to get more customers and make more sales! Do you have to pick just one niche forever… heck no! While those are targeted to my kind of rebel entrepreneur subscriber, they also touch on things people want to do… make more money and know secrets. If you have an accounting business and someone just joined your list, they are probably interested in either business or personal accounting and then things that could effect their lives in these areas! Yay! I am so glad we are Etsy seller friends now! This is actually a series of about 17 emails that go out over 99 days, sending every Sunday. The thing they are NOT is a pitchfest for me. I genuinely try to help my subscribers get up to speed with Etsy and learn to take pretty product photography! Additional Resource: Write better email subject lines, 100 Great Email Subject Lines! I like to send them one final email that says that I have enjoyed talking to them every week, and that I will continue to send the weekly newsletter. I sell craft parts, some handmade but most commercial, and I noticed that most craft part sellers don’t offer free shipping on Etsy so maybe that is why it hasn’t made a big difference in sales. Anyway, thank you for all your research and emails – it really has helped me a lot. I happened to pull Doug’s message out, but honestly, I get these kinds of emails all day long which is why it is so cool to do the autoresponders. They are out there churning away, helping people while I am busy writing a blog post! What Are You Trying To Accomplish With Your Autoresponder Emails? Your goal will be different, but make sure it is clear and in line with your business model. My goals are to get people to my websites & videos PLUS selling affiliate products when appropriate to help them. You Should Try To Get Them To Answer You! One quick thing about email service providers and how they work… companies like Convert Kit (which I use) and Mailchimp, are Email Service Providers. They are responsible for emailing out your messages and policing whether you are a legitimate business person or just a spammer. One key way you can prove you are NOT a spammer is to get your subscribers to hit reply and answer you! I have a message to talk back to me in many of my autoresponder messages, and you know what? People email me back… YAY! This “response rate” helps indicate to my email provider that I am real and not a spammer. When I was researching this post I sent out a plea to my peeps for all their questions. And boy, did they have so many questions about autoresponders. I promise, once you understand them they will change your life! Email Autoresponders are sometimes called drip email campaign or email sequences. They are a series of marketing emails you send out after someone signs up to your list via a form. It is the same thing as an autoresponder, automation or drip email campaign. Oh, this is SUCH a good question. 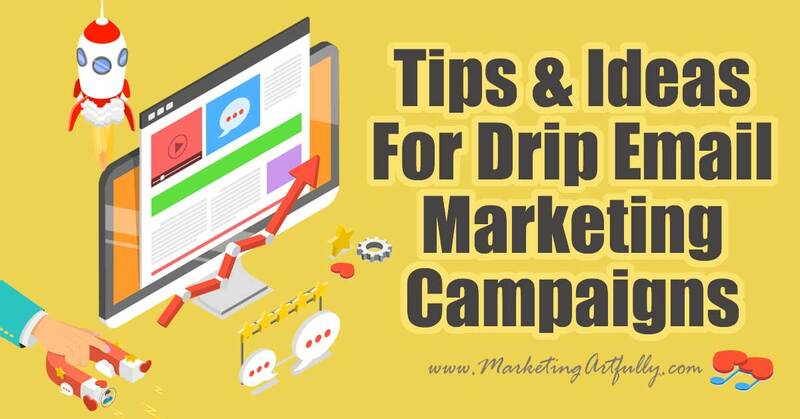 I think everyone should have a drip campaign that sits out there and talks about your business passively. Once your autoresponder is set up, there is minimal need to mind it, and it just keeps churning out love for you and your business. It can help your customers get to know you, sell your products or affiliate products, drive traffic to your website, get people into your store. Functionally, it can accomplish almost anything you set out to do! What is the best email autoresponder software to use? Beginner – if this is your very first time doing email marketing, then I recommend Mailchimp. They have a free program up to 1,000 subscribers and do have automation in there for free. Beyond Beginner – if you are even a little serious about email marketing, I recommend ConvertKit which is the company I use. They are super affordable and have SO MANY features that are great… scheduling on certain days, tagging your people from links, giving people choices on forms. What is an autoresponder message? The whole thing (signup form + messages) is your autoresponder, drip campaign or email series. Within that are individual messages. Sometimes as few as 1, sometimes hundreds. Mine tend to max out around 20. Are the free autoresponder services any good? 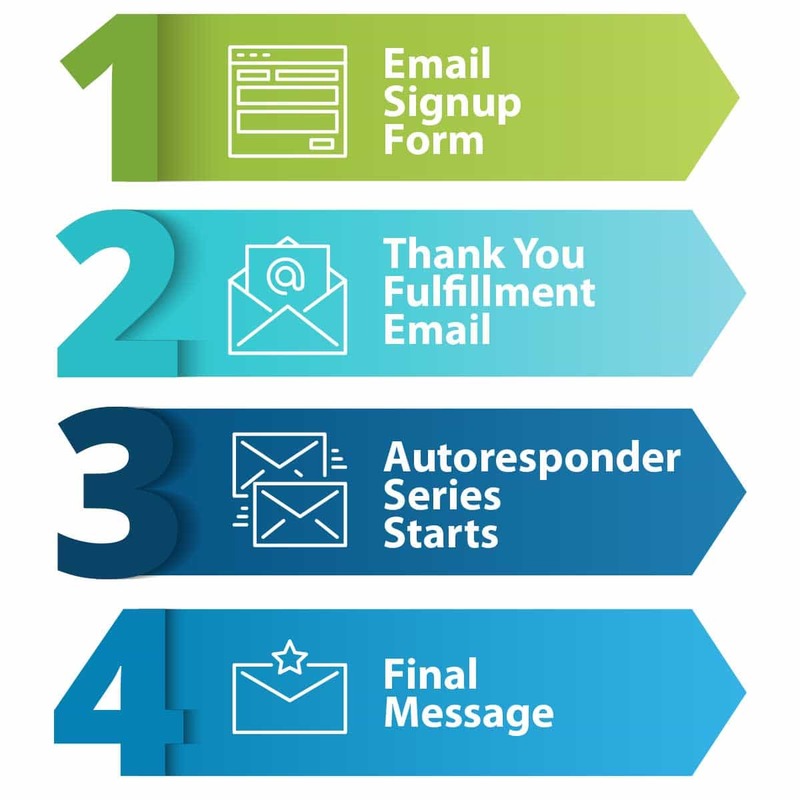 The free autoresponders are better than doing nothing and are a great way to get started if you are on a budget for sure! That said, because they are free, spammers use them more than paid services and so their deliverability (how many messages actually get seen) can be pretty low. Honestly, I would rather pay a little bit for a great service than limp along with something free that only kind of works! Should I just use an autoresponder series instead of actually sending marketing emails out? You could for sure if you don’t like the pressure of sending out spontaneous messages each week. You could send out perpetual autoresponders, just adding to the ends as you have more things to talk about. I think this would work particularly well if you have a monthly email newsletter. You could send weekly automatic messages and then just one monthly email. Can I just use my Outlook or other free email service instead of spending on a service? Nope, you cannot use a consumer service like Outlook, Gmail or Yahoo. First off, it violates their terms of service. Secondly, if you send multiple messages from your regular email provider you will eventually be considered spam and even your regular emails won’t work anymore. Will an autoresponder free up my time? It will for sure! It allows you to send multiple messages over time automatically. You could save even more time by using it to send directions about how to use your services, coaching or products. If I have my own website do I need to use a service as well? Yes! There are some plugins that say they will use your WordPress site to send messages out, but you run into the same kinds of problems you with Gmail or Outlook. Because they are not official email service providers your messages may not be delivered and you may be marked as spam. I left this one for last because all of these email words can be so darn confusing! A broadcast email is when you send a single message to your whole list or even just a little part of it, but it is NOT automatic. This could be your weekly newsletter or an update like I sent to people who had bought a course from me. 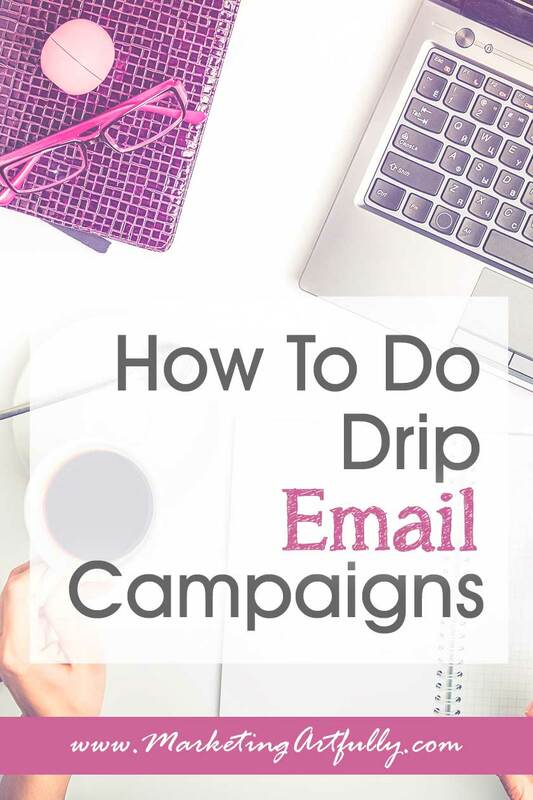 Previous Post: « All My Best Tips and Ideas For Email Marketing!